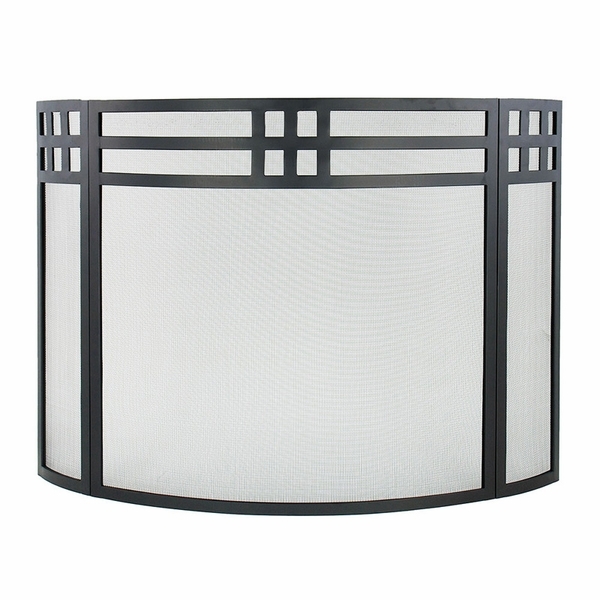 Nothing dresses up your fireplace more quickly and easily than this Fireplace Screen from the Adams Company. With its stylish black finish, this folding Fireplace Screen features piano hinged panels for extra support and protection. No matter what the decor in your home, you'll find a fantastic fireplace screen from the Adams Company that'll fit your decorating scheme like a glove. The center panel on this screen measures 32" W x 31" H, while the side panels measure 8" W x 31" H.
What is the radius of the curvature of this product? Thanks. Per the manufacturer, the radius is 6". What is this Minuteman X800460 black fireplace screen made out of? Is this screen rust resistant? This screen is made of steel and is not rust-resistant. Can this screen also be placed with the three thick bars on the bottom? Because this particular model does not use support legs that necessitate how you use it, the screen could indeed be inverted if you wish. This fireplace screen came already completely put together. It looks just like its online picture. The screen's quality is exceptional, and it is quite heavy. The design is very elegant, and it adds a beautiful accent to our hearth. This screen was delivered even faster than I expected and looks very nice in my room. It is built well and seems quite durable. I am quite happy with this product. After remodeling our fireplace with mosaic travertine tile and installing a brown granite hearth, I really wanted the perfect fireplace screen to complement the new look. I thought I needed a flat screen, but I fell in love with this one as soon as I saw it. It has a lot of character, but it is also well constructed and extremely sturdy. It was definitely the screen for us.